G.E.M. Going The Extra Mile January 2019 - Peabody Engineering & Supply, Inc. 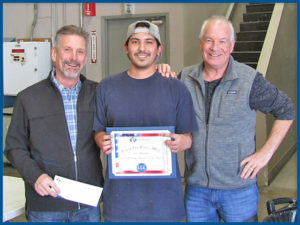 Nominated by his fellow Peabody Team Members – Congratulations to Jose Manchego who works in our Rotational Molding Department, on being January 2019 G.E.M. Winner! Jose looks for areas that need to be fixed or questioned. He will ask his manager if he is unclear about an order to make sure that it is shipped out correctly. He also likes to help his team mates complete their job duties and will help where ever he is needed. Jose is a happy person regardless of his work load. He likes to share and spread his good attitude with his co-workers. Jose always works with a smile on his face and happiness in his heart! Jose is a very hard worker and is always willing to lend a hand. Every time I see Jose, he is very pleasant and friendly. He is more than willing to do anything that needs to be done. 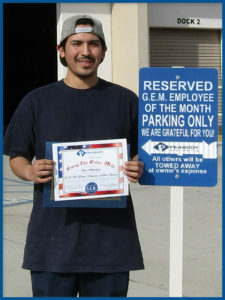 Jose works hard all the time, has a can-do attitude and asks questions when he needs direction. Thought out the year Jose is always consistent. Willing to adapt to changes on the fly and get things done with excellence. Jose demonstrates leadership skill in the Rotational Molding Department. I know I can count on him when I verify tank quality during month end sales projection. Jose is a hard worker and always willing to help when needed. In my opinion, Jose is always going the extra mile. He is constantly working hard, is always friendly, and never complains. He is always at work an dis ready to get the job done!